It can be hard sometimes to make enough time for ourselves in our daily life to improve our photography skills, but one of THE best things you can do is simply practice - getting into the habit of picking up your camera every day for even just ten minutes can have an big affect on how well you understand a particular concept, or just building in some muscle memory so you start to instinctively know where all your buttons and dials are on your camera. THIS is what stops you from fumbling around trying to get your settings right! With this in mind, I'm sharing an exercise today for beginners that will help you understand the affect aperture and depth of field has on your images. 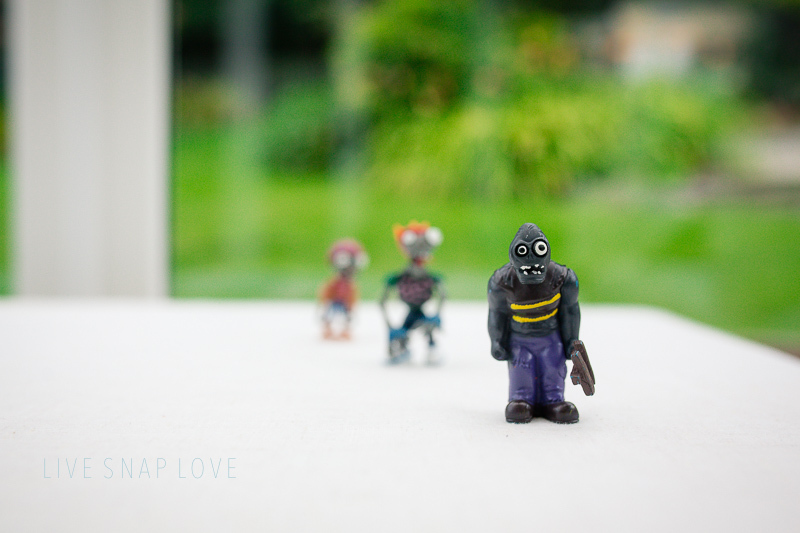 You are going to need three small objects - I'm using Zombie figures since there are always several lying around for me to stand on at the moment (usually in my bare feet 😂) but anything you have lying around will be fine! Get yourself in a room near a window, or go outside if you can - anywhere that has plenty of light is ideal. OK, now let's get your camera set up. Turn the dial at the top of your camera to A or AV for Aperture Priority. For this exercise, set your ISO to AUTO ISO so that the only element you are having to control is your Aperture (unless you are also comfortable changing your ISO too, in which case, go for it!) Your camera will take care of everything else for you, so all YOU need to worry about is your Aperture. Let's start by setting our Aperture at the smallest number. As your aperture is determined by your lens, not by your camera, this will be different for everyone. If you have a Canon / Nikon 50mm F1.8, this will be F1.8, if you have the kit lens, this might be something like F3.2. Focus on the figure that is in front. (You are going to keep focus on that figure ALL the way through, so you can see the difference Aperture makes all by it's little ol' self) Take your picture at your lowest Aperture number. You can see that only the head of my zombie (at this point I'm maybe wishing I had chosen slightly nicer example subject, but let's just go with it) is in in focus - even his body is looking soft and out of focus, and everything behind him just falls into blur. The front zombies body is now in focus, and the ones behind are still well out of focus, but they are becoming a bit more defined, especially if you go back and compare it with the previous picture. In my image you can see that my front figure (a Guarantuar Zombie for those not well versed in Plants Vs Zombies) is now completely in focus, and you can now make out the second figure much more clearly. The one at the back is becoming clearer, but it still more out of focus than the second figure. Now you can see the second figure reasonably well, but that last figure, because it is farthest from the plane of focus, is still blurry - however it is clearer than in the previous picture. My final one was taken at F16, the smallest aperture I can use with this particular lens. You can keep going until you get to the smallest aperture of YOUR lens. Even at F16 that final figure isn't terribly sharp and clear, but you can still clearly see the figure. What you are seeing here, and what you should see in your own photos, is depth of field in action: as you increase the F number (making your aperture smaller) the area you have in focus gets larger. If you have an extra five minutes (and know how to change your focus point) then change the point of focus to the middle figure, and drop your aperture back down to it's lowest setting. You should then see something like the image below, where you have both the area in front and the area behind blurred and soft. There you go! A ten minute exercise you can do today that will help you understand aperture and depth of field, and how they affect your images! Before you go, be sure to download my free guide to Aperture - you’ll get an Aperture Cheat Sheet AND a guide to getting great background blur!